History has a way of repeating itself. In the Sunken City that was once Paris, all who oppose the new revolution are being put to the blade. Except for those who disappear from their prison cells, a red-tipped rook feather left in their place. The mysterious Red Rook is a savior of the innocent, and a criminal in the eyes of the government.Meanwhile, across the sea in the Commonwealth, Sophia Bellamy's arranged marriage to the wealthy René Hasard is the last chance to save her family from ruin. But when the search for the Red Rook comes straight to her doorstep, Sophia discovers that her fiancé is not all he seems. 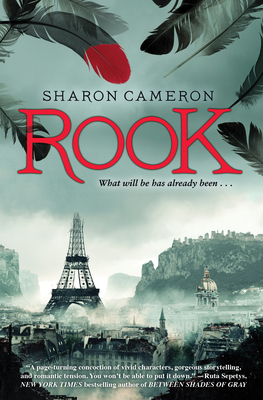 Which is only fair, because neither is she.As the Red Rook grows bolder and the stakes grow ever higher, Sophia and René find themselves locked in a tantalizing game of cat and mouse.Daring intrigue, delicious romance, and spine-tingling suspense fill the pages of this extraordinary tale from award-winning author Sharon Cameron.